If you’ve ever studied goal-making or achievement then you might be familiar with the S.M.A.R.T. goal format. This format is said to be the “gold-standard” when it comes to making goal. In this post, I will tell you why SMART goals are smart and where many people mis-use them. Specific – In other words, avoid being “vague.” An example is I would like to be “toned” versus I want to be able to fit into my “skinny jeans” from college. Measurable – If you want to “lose weight” how much would it be. 5 pounds, 50 pounds, what’s your specific goal? 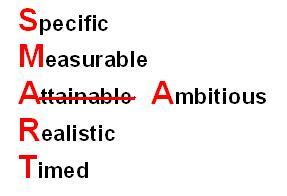 Attainable – This sounds a lot like “realistic” but it has more to do with your individual schedule. If you work 17 hours a day and can not follow a good diet, then your goal should be more aligned with what you can actually do. Realistic – This is the more “general” realistic. In other words if you want to lose 50 pounds in 20 days through diet and exercise, you’re setting yourself up for failure. Time-Bound – You should have a specific time by which you want to hit your goal. Having explained what the SMART goal format stands for and is, let’s look at it’s strengths and short-comings. S.M.A.R.T. goals help you to focus on a specific task at hand. Earlier this year I wanted to break the 200 pound mark and in fact hit 205 (which was my goal). I also wanted to hit it by April 15th, which also happened. Having that measurable goal and knowing the why behind why I was training allowed me to keep the focus on the goal at hand. 1 – If you’re not willing to make the requisite sacrifices, having this SMART goal format will leave you disenchanted with your goals and with yourself. 2 – Too often, people make unrealistic goals or goals that are not “attainable” given one’s lifestyle. By having these unrealistic expectations, they are much more likely to give up and adapt an All-or-Nothing mindset. 3 – Lack of breaking the larger goal down into requisite actionable items. This is by far my biggest issue with SMART goals – they say almost NOTHING about what you should actually do to hit your goals. Besides that, they glaze over the short-term and intermediate steps that y0u will need to be focusing on in the moment. You see, life’s battles and goals are not won in one fell swoop. You won’t learn to ride a bike on a whim, write a book in one sitting or create a body worthy of awe by making a “SMART” goal. Instead you will have to make a small decision this moment and another in a couple of minutes, and another a couple of hours from now. It’s this focus away from these small decisions which is the biggest problem with SMART goals. The bottom line is this – SMART goals are great, ONLY when combined with how you will handle the small decisions you have to make every day. You have to allow yourself to have a dual focus. One eye is continually kept on the horizon, reminding yourself what your ultimate goal is. The other is on the here and now. What you must do today, in this moment is the only decision that counts towards your goals. Decisions you might make in the future don’t count and never will. Will this piece of cake move me closer or further away from that goal? Will “skipping this workout” move me closer or further away from my goal? Is telling myself “I deserve this” when I’ve only gone to the gym once this week the truth? Can I allow myself to go to bed earlier so that I can wake up in the morning and workout or do I stay up and read? You must focus on the small decsions. These small decisions are what make or break goals. Not the “One large decision” to workout; instead it’s the small ones, day in and day out. In the end, you’re the only one that can make those choices. Instead of making a Smart goal, you should strive to find your “Why” first. After you’ve discovered your why, making a SMART goal comes down to being honest with your lifestyle and what you’re willing and unwilling to sacrifice in order to achieve that goal. Beyond that, you should also set yourself up with realistic expectations. You can read more about Realistic Expectations here. For more information on how to find your Why and How to Start and Maintain a Healthy Lifestyle, please visit the Free Reports page. This goal format is so important! You have to be able to make realistic goals so you can attain them otherwise the more you fail the less goals you will set.